Kate Steinle's parents spoke with ABC7 News about new developments in the investigation of the man accused of killing her as they mourn her loss and celebrate her life. PLEASANTON, Calif. (KGO) -- Kate Steinle's parents spoke with ABC7 News about new developments in the investigation of the man accused of killing her. They have nothing but praise for law enforcement for making a quick arrest in this case, but this case isn't how they want their daughter to be remembered. Inside the Steinle family home in Pleasanton stands a Father's Day greeting card that now holds even more significance for its recipient. "Being with her that day, and experiencing what, the horror that we experienced, I have a little solace that I was with her," said Jim Steinle. On Wednesday, Jim Steinle was visiting his daughter in San Francisco when tragedy struck. Kate Steinle, 32, was randomly shot at Pier 14, not too far from her apartment. Her father said she didn't go down without a fight. "You could feel she was fighting, gasping for every breath. She fought right up until the end and I wouldn't expect anything less from her," he said. 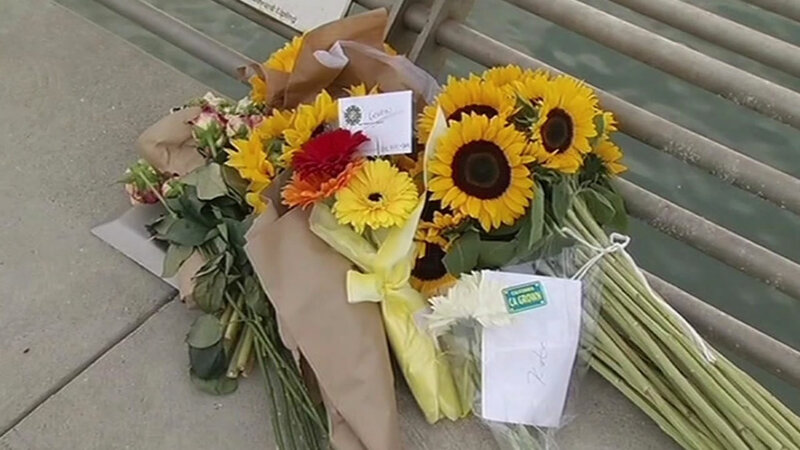 The collection of flowers building on San Francisco's Pier 14 is bringing some comfort to Kate Steinle's family after losing her in a shooting Wednesday. Family members say Kate Steinle's smile lit up the entire room. "She was very independent, very assertive, very charming and beautiful, and we loved her immensely," said Kate Steinle's mother Liz Sullivan. Nearly 48 hours after the death of their daughter, Jim Steinle and Steinle's wife Sullivan are trying to come to terms with what happened. As the family tries to heal, new details regarding the criminal past of the accused killer have emerged and that's lead to questions as to why he was on the streets. "I'm at the point in my faith where I don't know if I can forgive him right now, but it's really not important to us," Jim Steinle said. What is important is sharing with the community how much they cared for their daughter, a passionate, charismatic woman who loved her job, loved her city, and loved living life to the fullest. "She's up there, she's probably running the joint by now. That's the way she was, you know, she's a very take charge girl," Liz Sullivan said. The is family now relying on faith and friendship, to move forward.